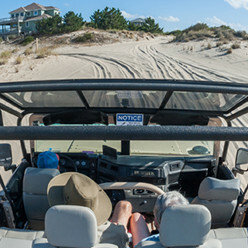 The neighborhood of Ocean Lakes can be found at the northern end of Corolla’s Ocean Sands beach community in the Outer Banks of North Carolina. This 600 acre vacation rental beach community features beautiful ocean views and miles of pristine beaches to enjoy with your family and friends. Ocean Lakes is the newest section of Ocean Sands, and guests to this area enjoy amenities such as a fully stocked ten-acre fishing lake, community pool with sun decks, and tennis courts. Most of the beach rental homes in this area are 4-8 bedrooms. Corolla attractions, shopping and restaurants are all just minutes away as well.